This biOrb is definite eye candy! Extremely easy to set up. Low maintenance because of the quality filtration system. Filter may be a wee bit strong for bettas. (You may have to replace it with a less powerful filter depending on your betta.) The tank has a magnifying glass effect. Some people love it, others don’t. Updated on 2017-02-19 – This 8 Gallon biOrb Aquarium Kit, also called “biOrb Classic 30” looks fantastic no matter where you put it. If I were you, I would keep an eye on it when friends are over or else it might disappear on you without you even noticing. This tank is a great option for anyone, but especially people just starting out in the aquarium world, since it is easy to set up and clean. There is nothing worse than starting your first aquarium and having a hard time setting it all up, so this is a good bet since you shouldn’t have any problems with the biOrb. Keep reading for our biOrb Aquarium review. This particular biOrb aquarium measures around 16.5 inches (height) x 15.7 inches (diameter) and weighs approximately 68 pounds when it’s completely full. Not entirely impossible to move it after you have set it up, but enough to make you think twice about it, so make sure you find a good spot for it. Aside from its awesome look, it comes with a good filtration unit so you don’t have to clean it as much as other tanks around the same size. I’ve read a few comments on the Web stating that the filter may be a bit too much for bettas to handle. Personally, I can’t say that I’ve had any issues with that, but every betta is different. If your betta starts complaining, you may have to switch the filter for a less powerful one or try to dampen it a bit. The main feature that have some people loving this tank even more (and others not so much), is the magnifying glass effect. Because of its shape and material, everything looks a bit bigger. Only you can decide whether you like that effect or not. The downside is that it doesn’t come with a heater, which is an absolute must for all bettas. At least in my opinion. 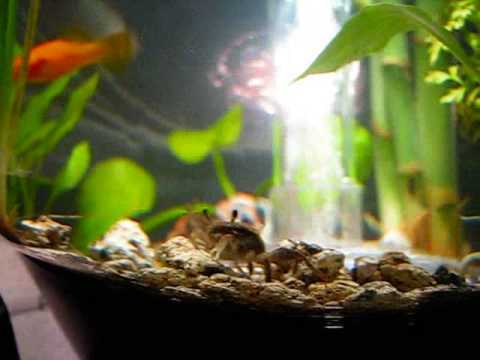 I hope you like my biorb aquarium review. If you have any questions or comments on this tank, feel free to use the comment box below to get in touch with us. Until next time! Before you leave, please check out our SHOP for amazing deals on betta fish tanks, decorations, supplies and more! Interested in other tanks? Check out our other fish tank reviews. Or, check out our Betta Fish Starter Kit section. There is always something good on sale. Updated on 2017-02-19 – I’m in the process of updating all my review posts to include a bit more information on the particular tanks. My earlier reviews were lacking in information such as what comes with the kits I review, etc. This post was updated with the product dimensions and “What’s In the Box” section. Wish I would have read this post before buying this tank. Wasn’t aware of the magnifying glass effect… Gives me a headache looking at it! 🙂 Worked out though… Sold it to some who did like it. Yep, it’s definitely not for everyone. Glad it worked out for you though. Txs for the feedback.